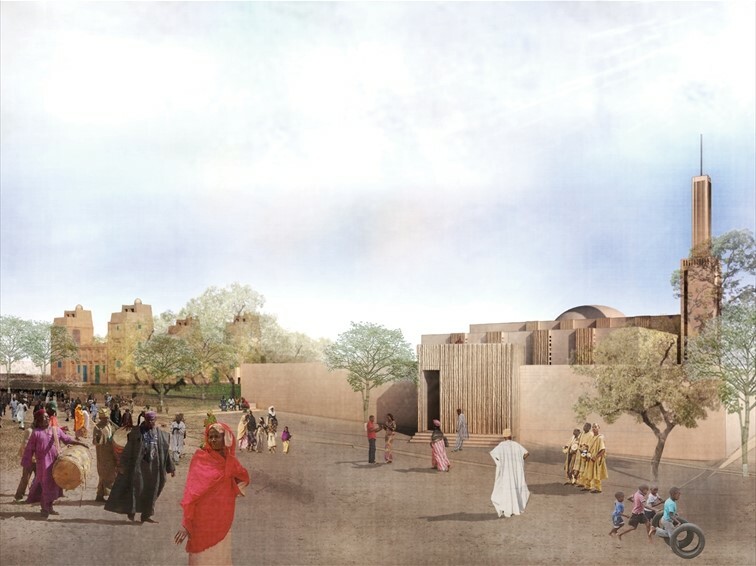 LafargeHolcim Awards Gold 2017 Middle East Africa winners for Religious and secular complex, Dandaji, Niger (l-r): Iranian architect Yasaman Esmaili and Nigerien architect Mariam Kamara. 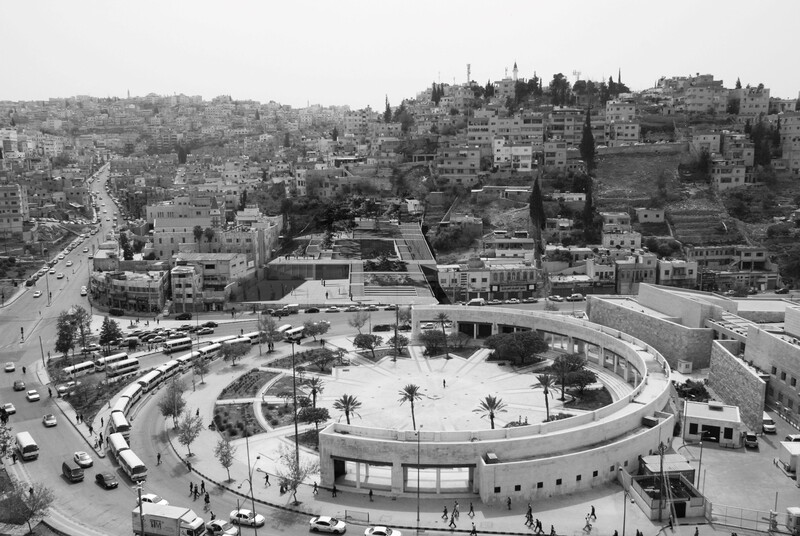 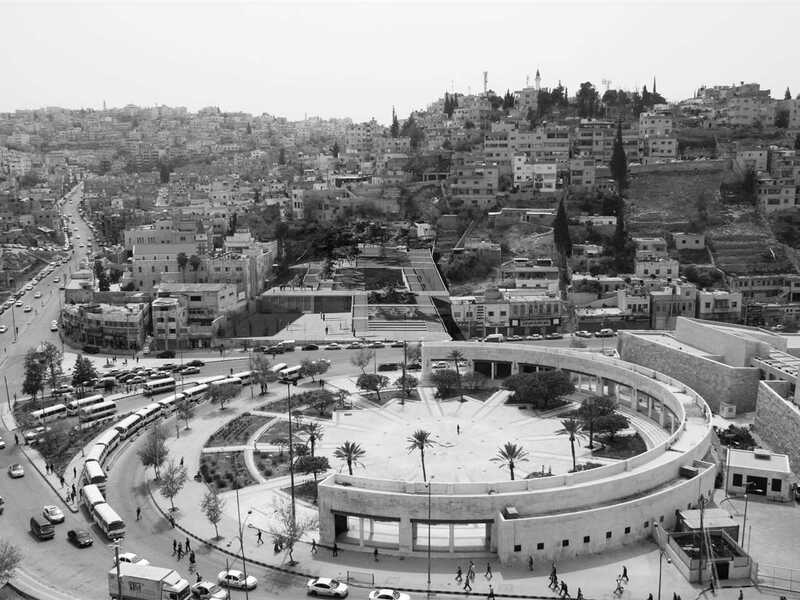 The two buildings and the site between them form a complex where the religious and the secular co-exist. 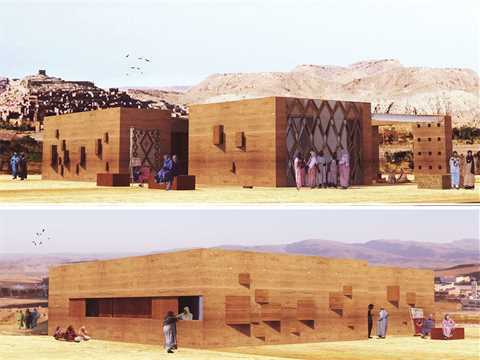 While the old mosque is transformed from within using a modular shelving and spatial system, the new construction makes a strong statement through its scale and flexible spatial organization. 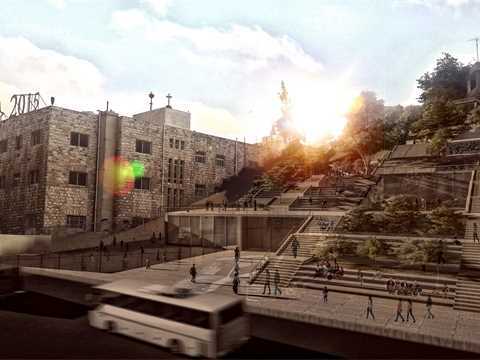 The grounds are developed into a promenade to and fro, enhanced by generous landscaping that will thrive thanks to an underground irrigation system. 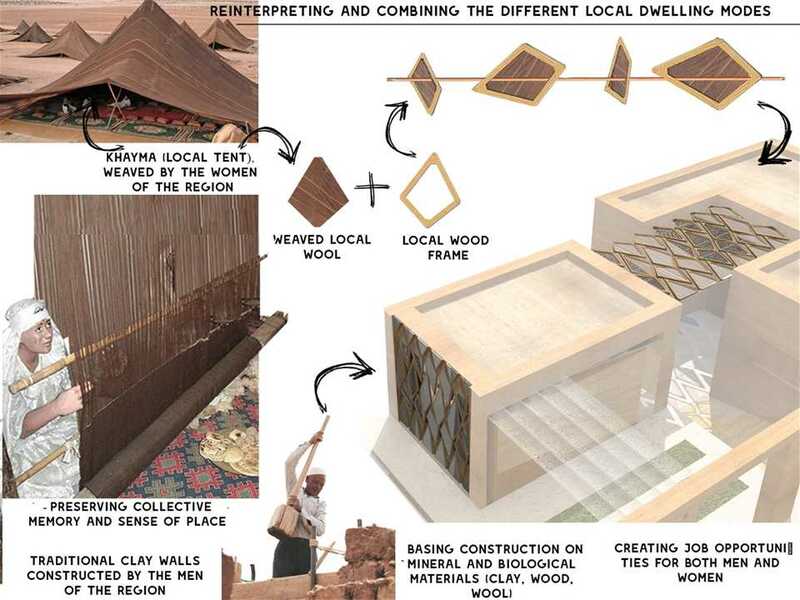 The project tends to foster cultural resilience through conceiving locally-adapted and extremely comfortable spaces, based on the reinterpretation, enhancement and combining of local materials and crafts: clay construction, carpets and tents weaving, and wooden structure. 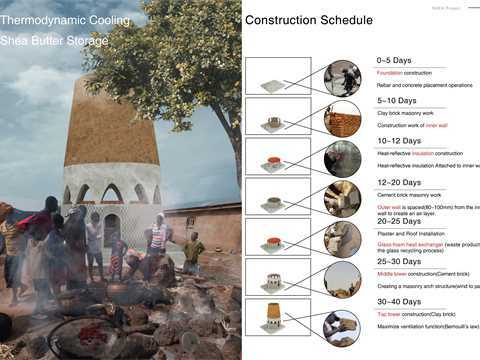 The construction process is participatory, and involves men and women. 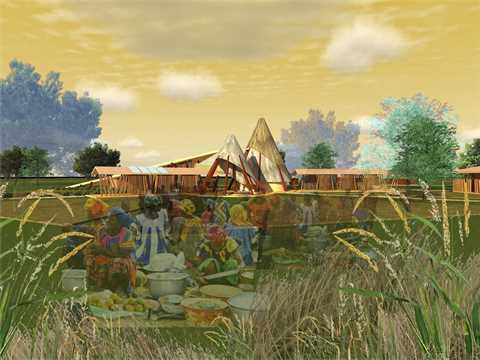 It regenerates activity within the village and promotes interaction between the inhabitants as well as their interaction with the place. 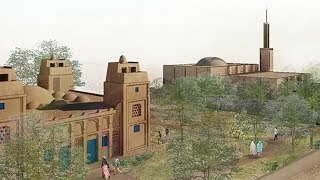 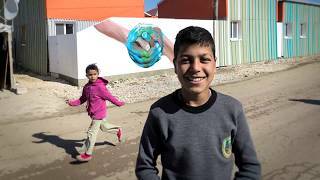 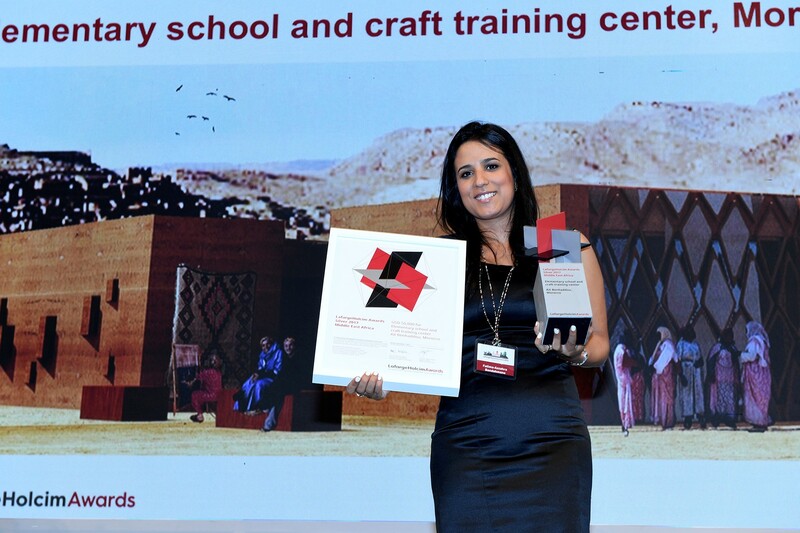 LafargeHolcim Awards Silver 2017 winner Fatima-azzahra Bendahmane, Ecoactiva, Casablanca, Morocco for Elementary school and craft training center, Aït Benhaddou, Morocco. 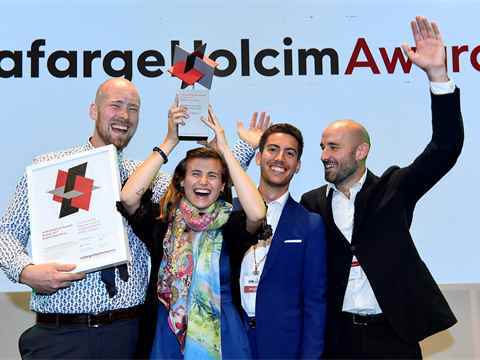 LafargeHolcim Awards Bronze 2017 winners (l-r): Ronan Glynn, Joana Dabaj, Riccardo Conti and Luca Astorri of CatalyticAction, Lebanon & United Kingdom. 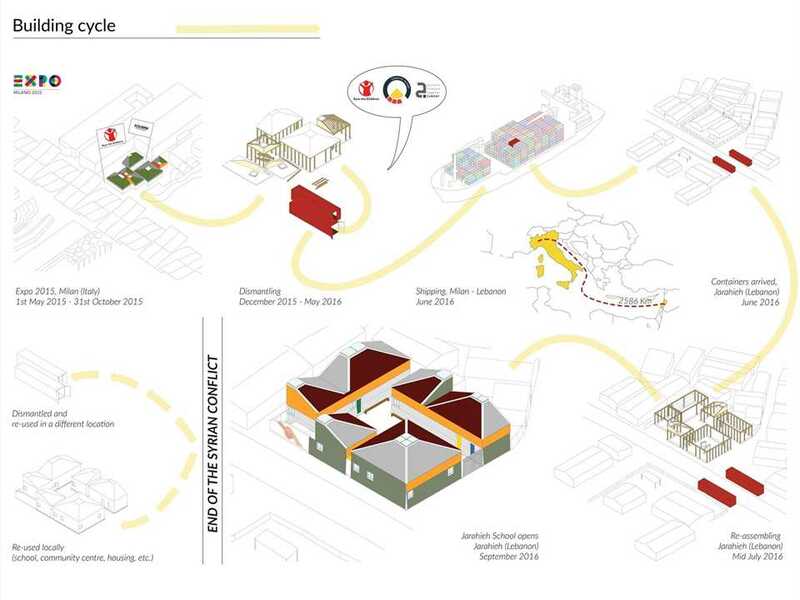 The project cycle diagram: The Save the Children Italy pavilion at the Milan 2015 Expo being shipped, repurposed and redesigned to become a school for Syrian refugee children in the Jarahieh Settlement, Lebanon. 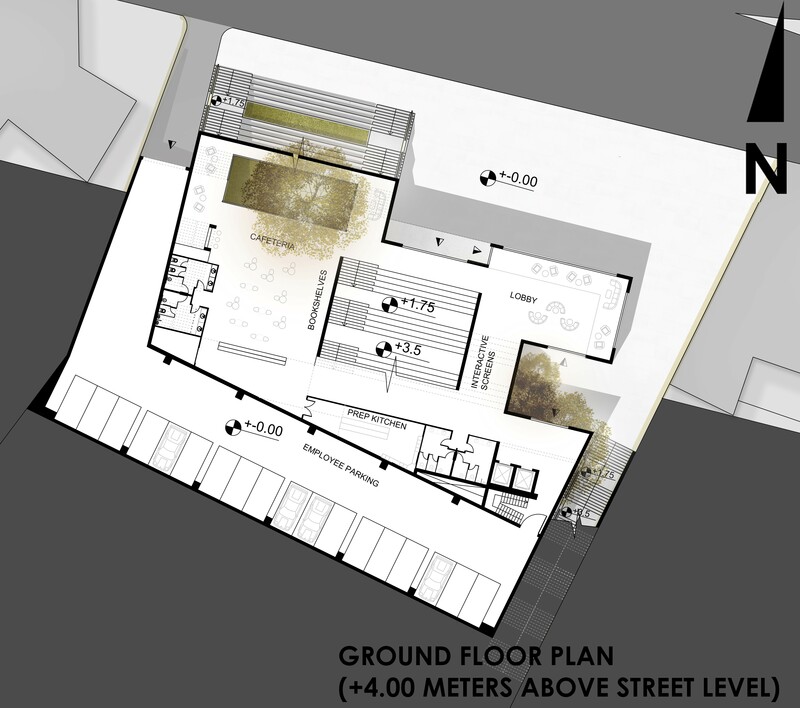 The cycle also highlights the possibilities of the building’s future reuse. 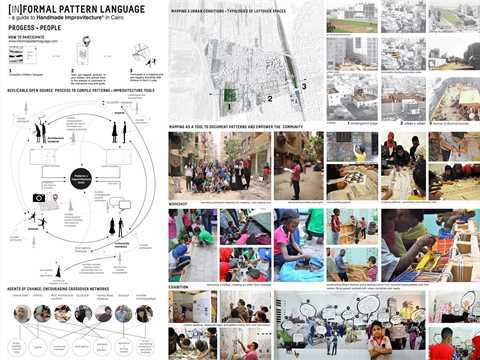 This pilot reuse strategy can be replicated on various scales to outreach a higher number of vulnerable populations. 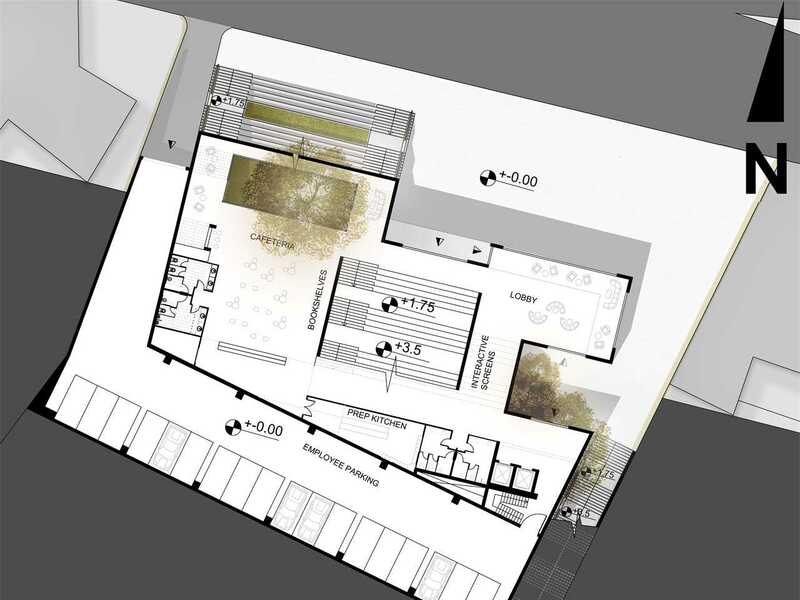 Elevation view of screen and roofline at night: A locally sourced bamboo and wood permeable dust filtering screen allows for cross ventilation and passive thermal control of the space, while filtering and emitting a glowing light gained from the roof PV’s at night. The section shows the ascending curve in the roof which shields the interior from peak heat while creating clerestories for optimal diffused natural light within. 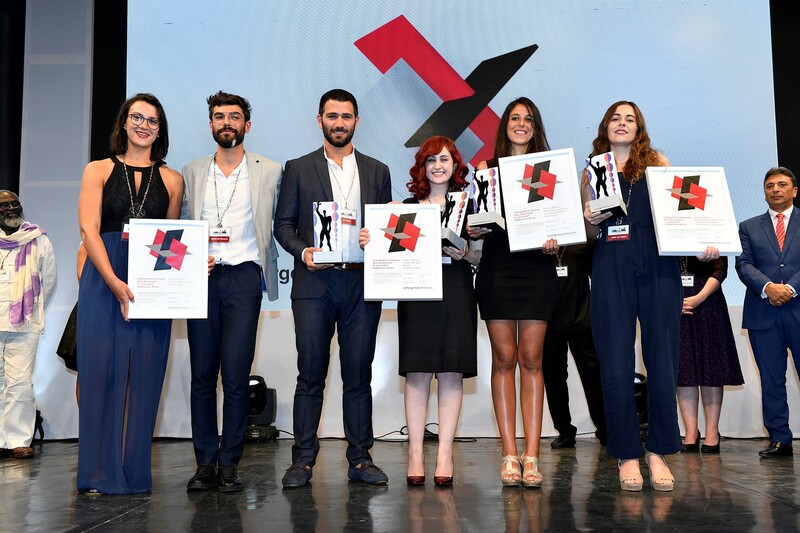 Main prize winners (l-r): Fatima-azzahra Bendahmane, Morocco (Silver); Yasaman Esmaili, Iran/USA and Mariam Kamara, Niger/USA (Gold); and Joana Dabaj, Riccardo Conti, Luca Astorri and Joana Dabaj, Lebanon/United Kingom (Bronze). 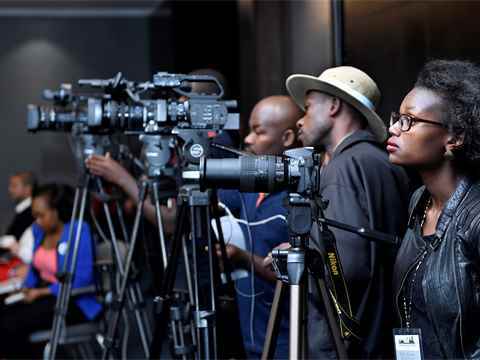 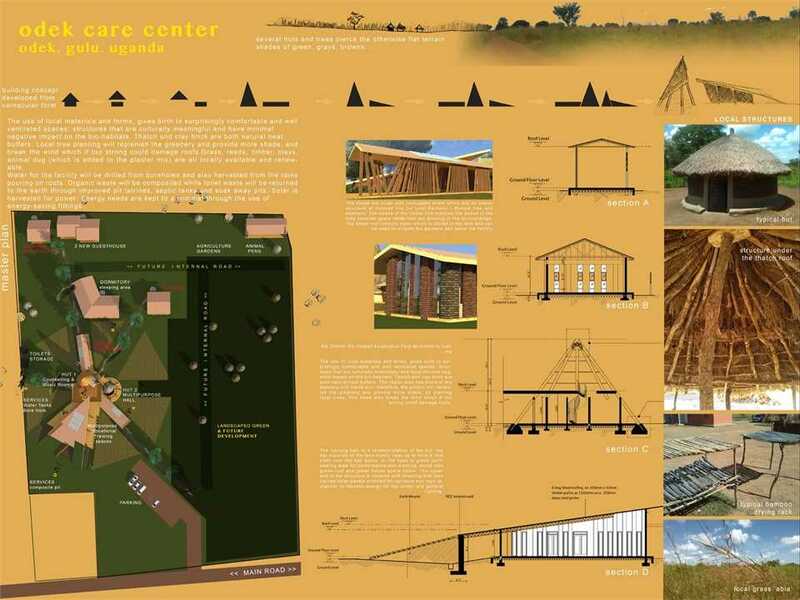 The headquarters is the heart of the project; it houses the school management, a video archive, a video room with 54 seats and two editing rooms, as well as some services for the garden. 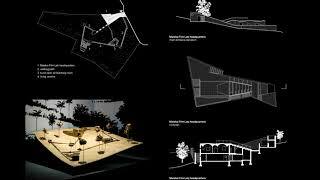 It is the first and the last leg of the living path. 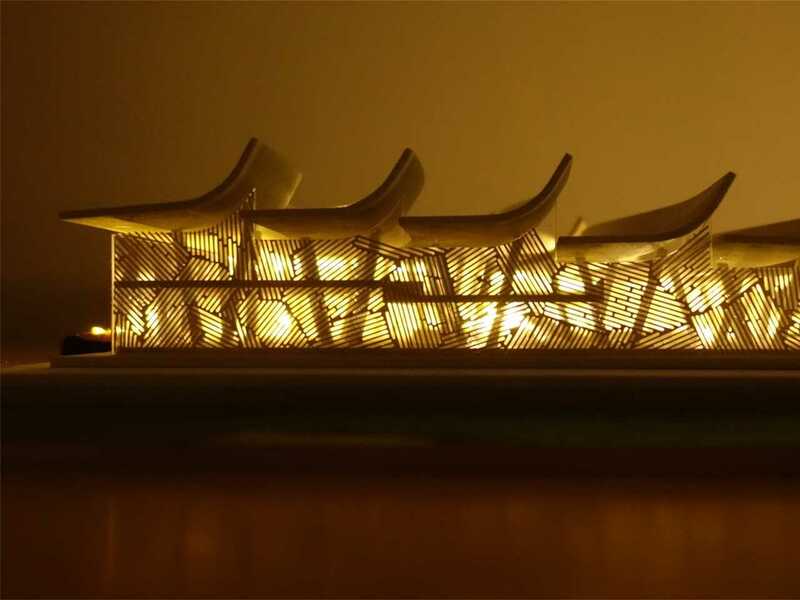 Symbolically it represents the beginning and the end of the human adventure. 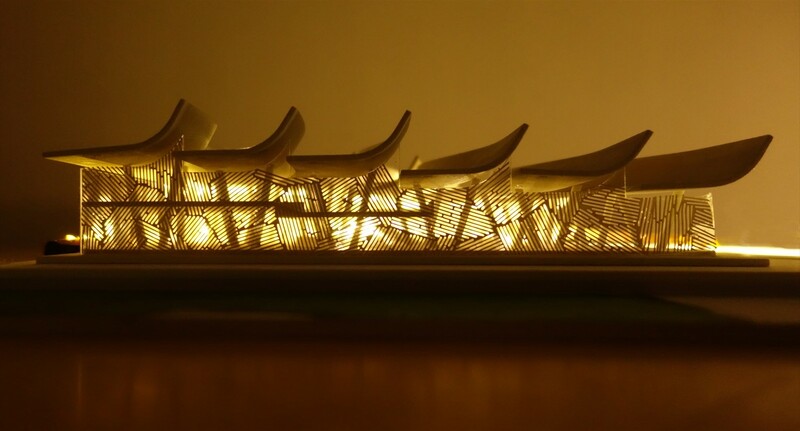 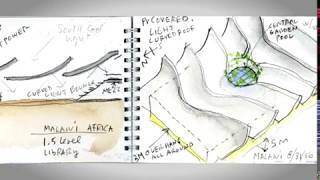 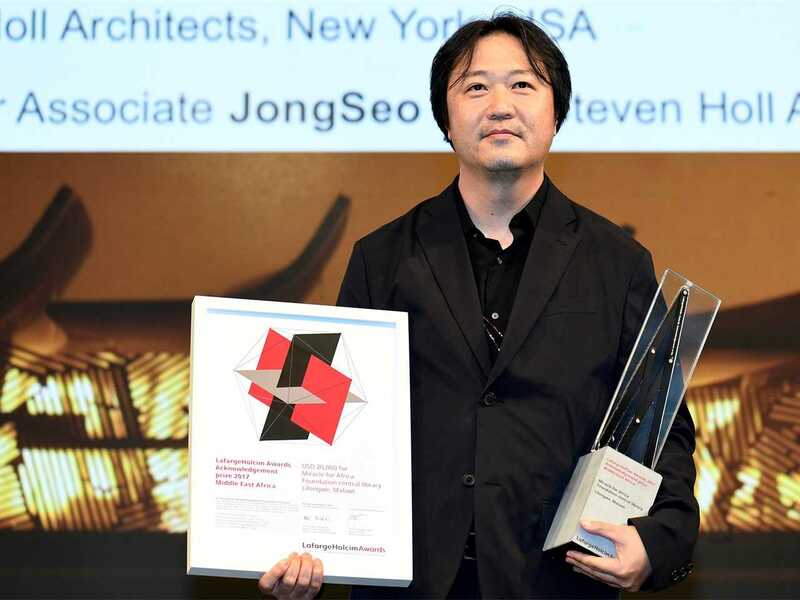 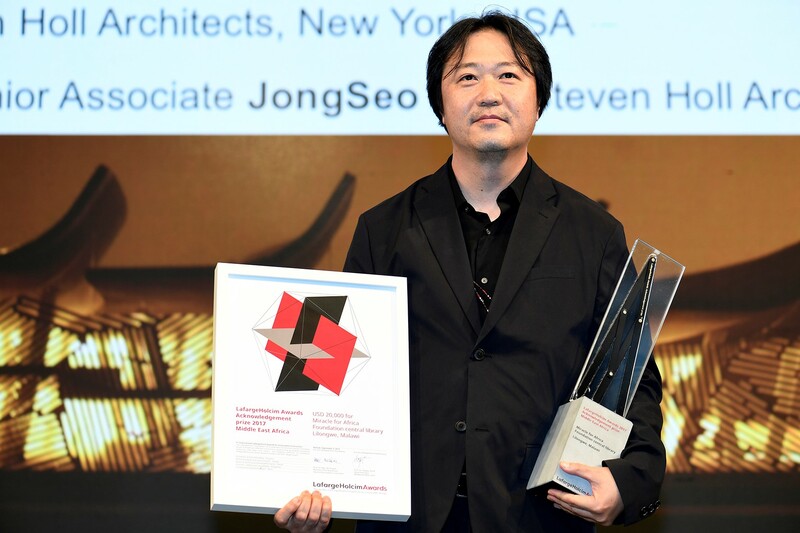 Acknowledgement prize winner Steven Holl Architects, New York, USA represented by Senior Associate JongSeo Lee for Ascending Array: Miracle for Africa Foundation central library, Lilongwe, Malawi. 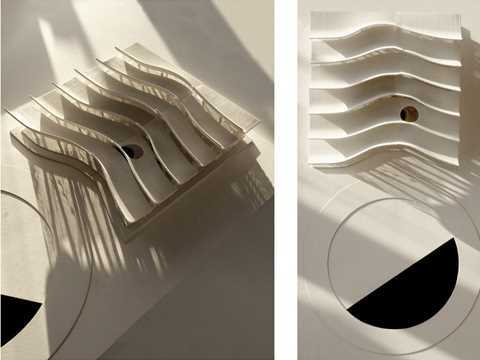 Operating principles: Thermodynamic cooler storage. 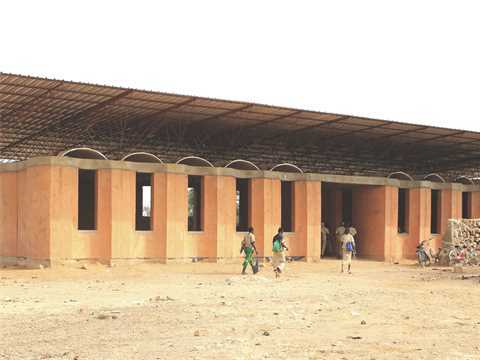 Shea butter store gets preserved by the cooling effect of evaporating water using no electricity. 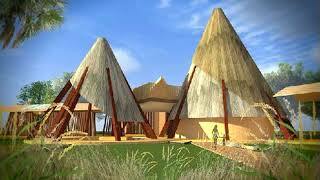 Basic technology mainly used in emerging countries. 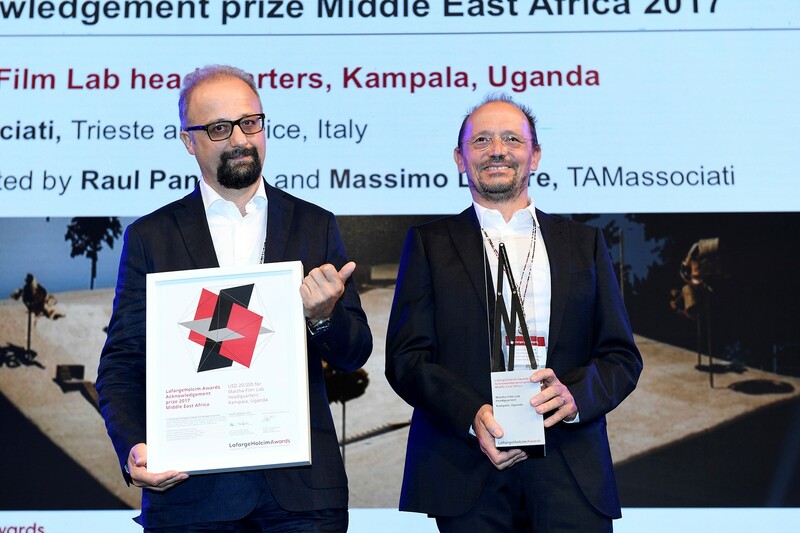 Acknowledgement prize winner TAMassociati of Trieste and Venice, Italy represented by (l-r): Massimo Lepore and Raul Pantaleo for Reel to Real: Maisha Film Lab headquarters, Kampala, Uganda. 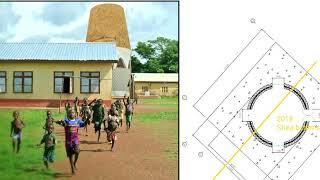 Through participation, the understanding of local context generates a spatial solution the aids in treating and rehabilitating children with nodding disease. The combination of technology and traditional methods, showcases how rural lifestyles can adapt and contribute to more sustainable community building. 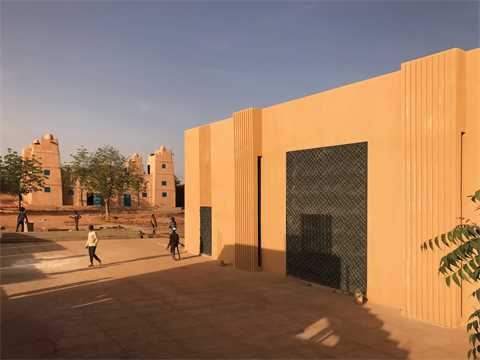 The detailing and building process will support local suppliers, artisans and households, thus contributing to the local economy. 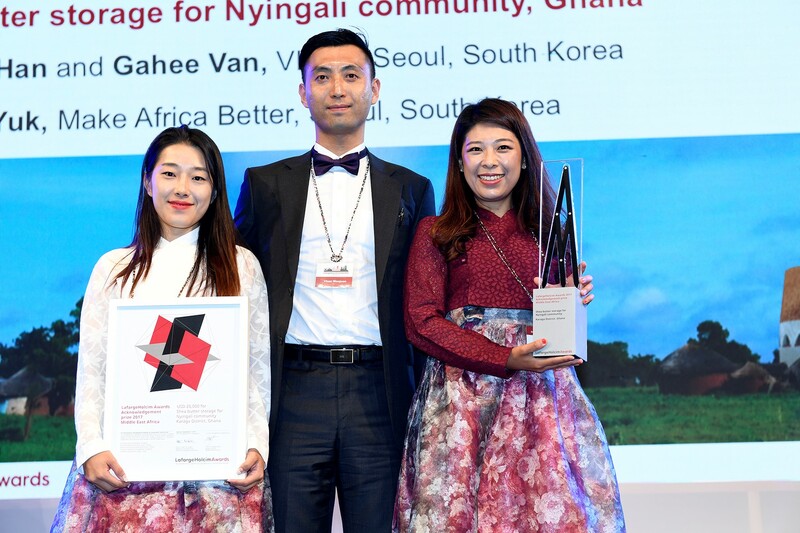 Acknowledgement prize winners (l-r): Gahee Van and Wonjoon Han of VHAN and Sookhee Yuk, Make Africa Better, all Seoul, South Korea for Refrigerating Jar: Shea butter storage for Nyingali community, Karaga District, Ghana. 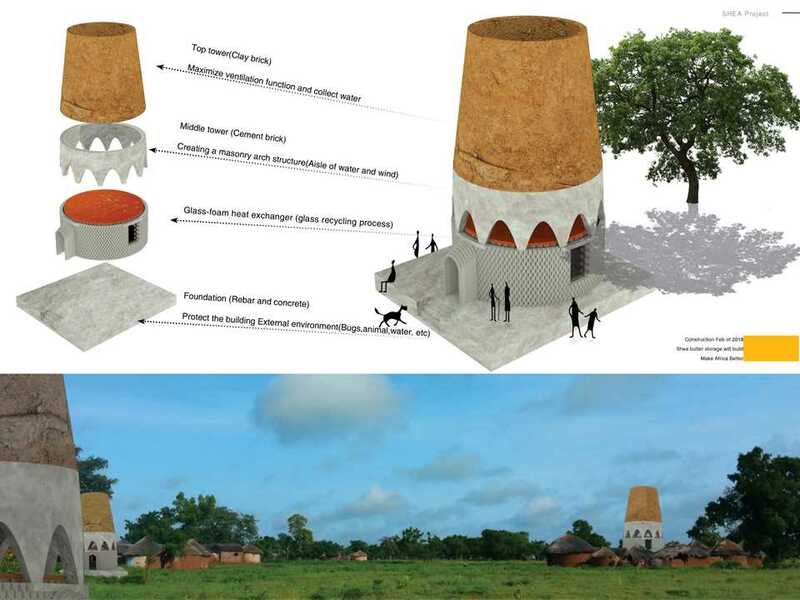 Pottery market & industrial tourism: Brickworks encourages clay-based trade education, which supports the development of other micro-industries such as pottery. 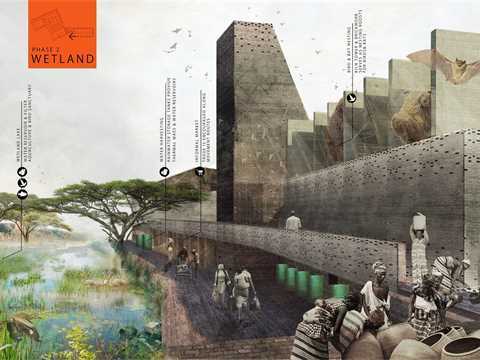 Clay-based markets are therefore introduced in open spaces within the Brickworks, and encourage secondary economic activity such as Industrial Tourism. 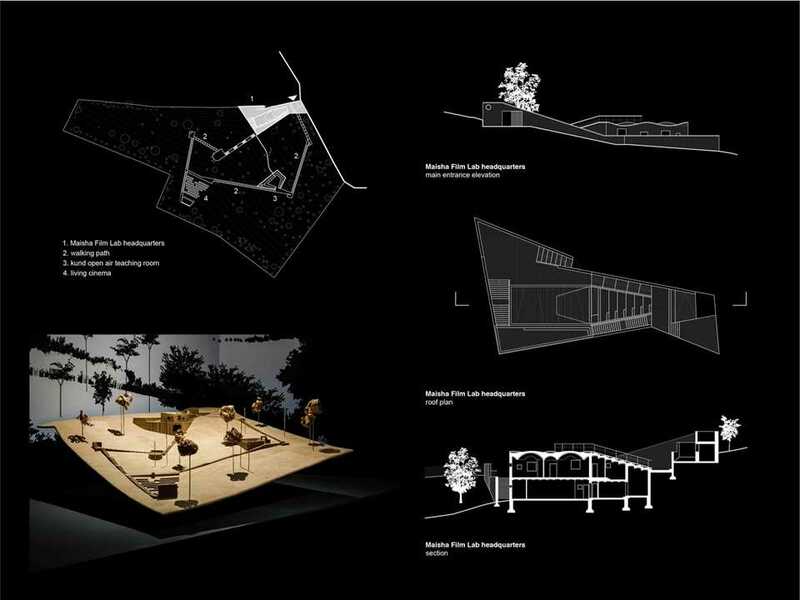 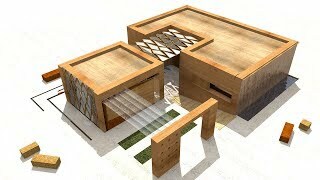 These spaces are designed with an open program to allow a wide range of socio-economic activity. 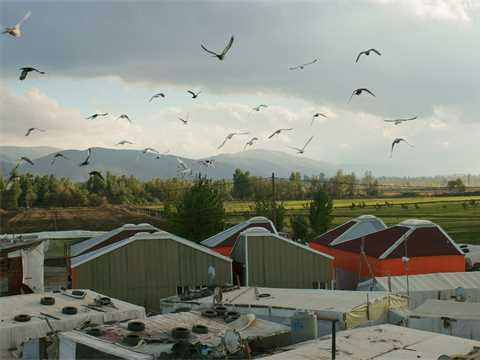 The slanted steel roofs use local materials and are designed to harvest water. 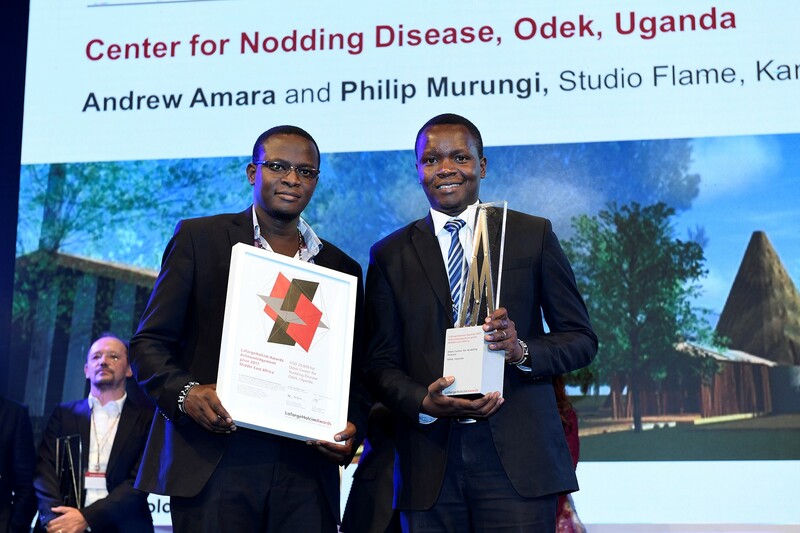 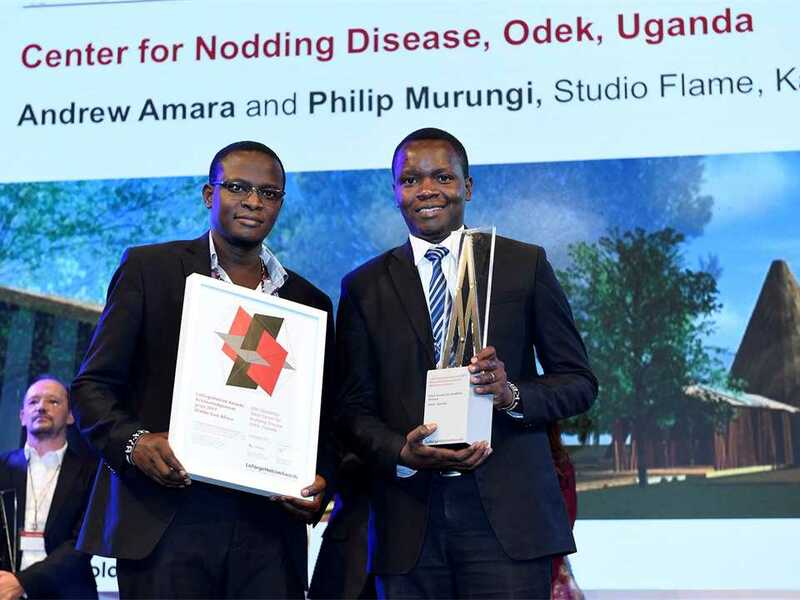 Acknowledgement prize winners (l-r): Philip Murungi and Andrew Amara of Studio Flame, Kampala, Uganda for Through the Looking-Glass: Odek Center for Nodding Disease, Odek, Uganda. 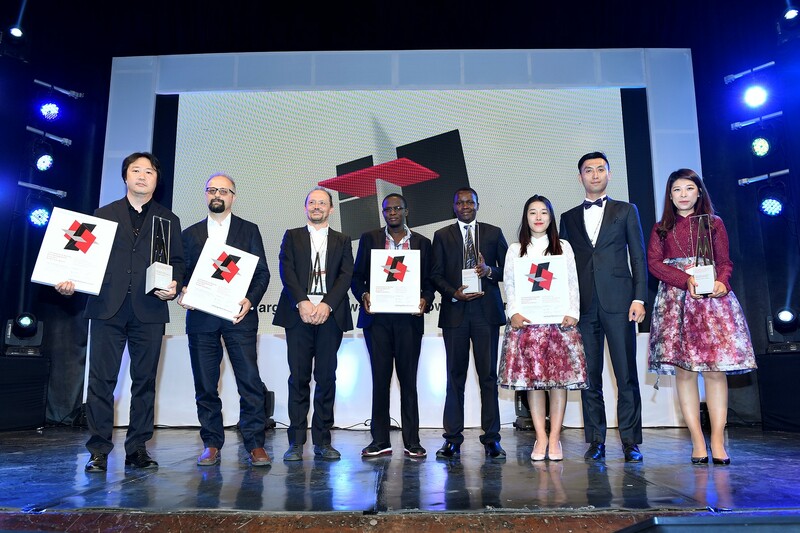 Winners of the LafargeHolcim Awards Acknowledgement prizes (l-r): JongSeo Lee representing Steven Holl Architects (USA for project in Malawi); Massimo Lepore and Raul Pantaleo (Italy for project in Uganda); Philip Murungi and Andrew Amara (Uganda); and Gahee Van, Wonjoon Han and Sookhee Yuk (South Korea for project in Ghana). 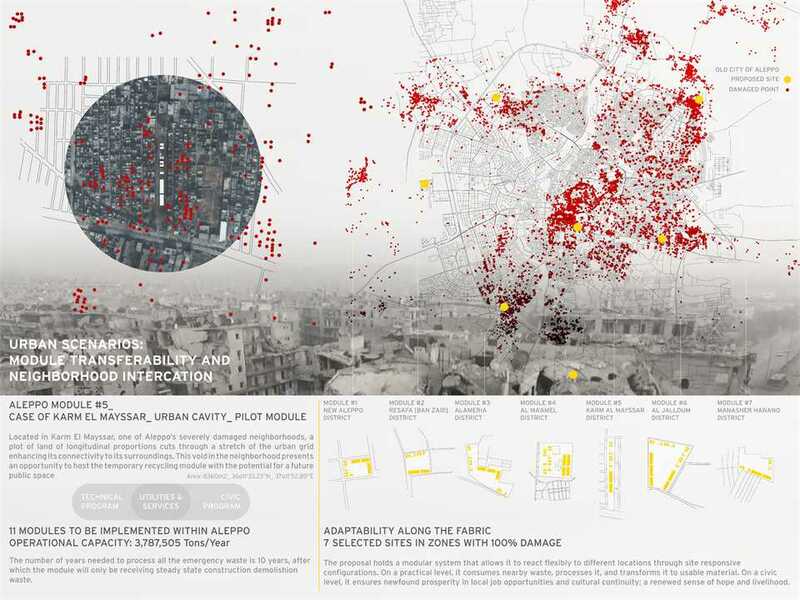 Zooming into Aleppo: Recycling modules work together as a network at the city level. They respond to their allocated neighborhoods. 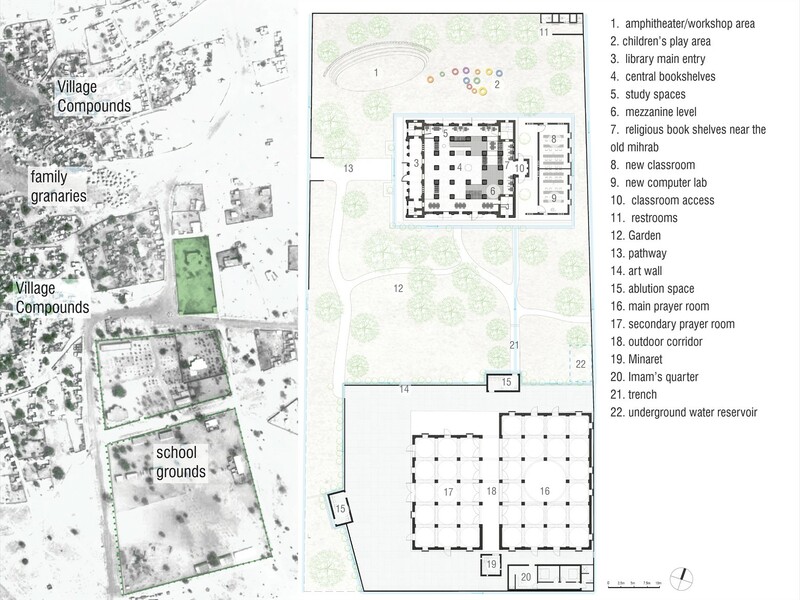 The proposal holds a modular system that allows it to react flexibly to different locations through site responsive configurations. 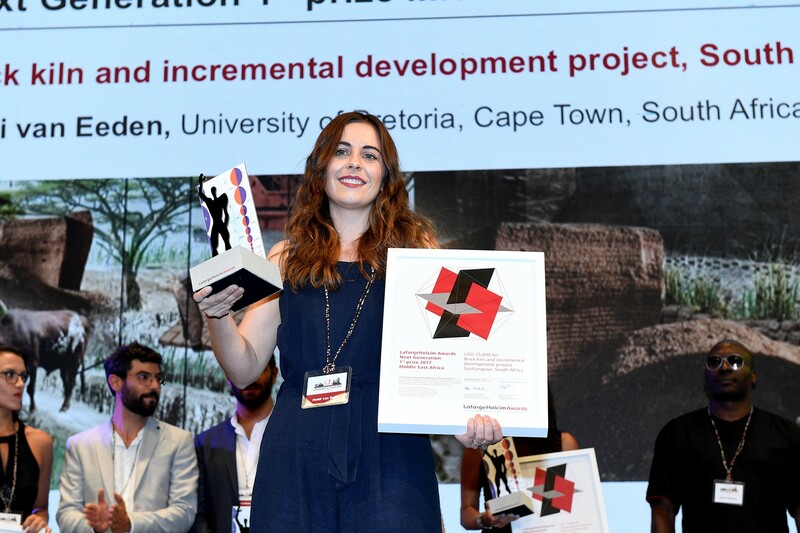 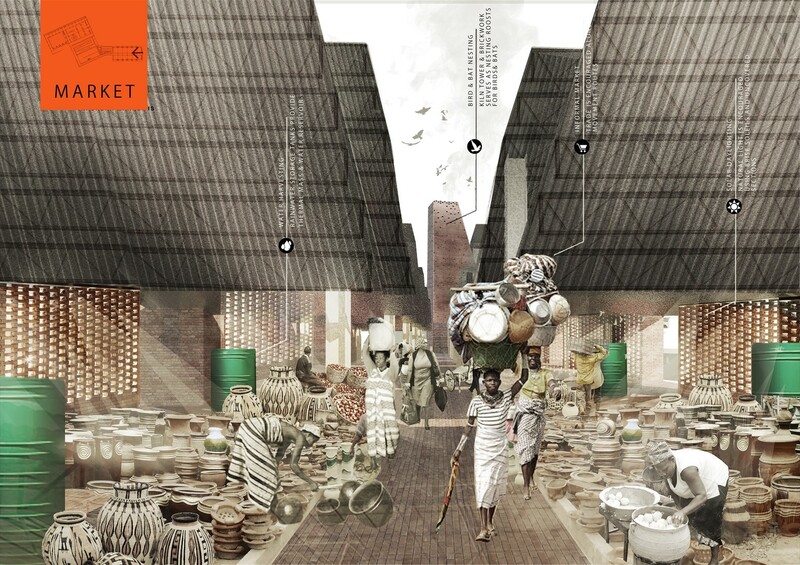 Winner of the LafargeHolcim Awards Next Generation 1st prize 2017 Middle East Africa Heidi van Eeden, University of Pretoria, Cape Town, South Africa for Brick-Works: Brick kiln and incremental development project, Soshanguve, South Africa. 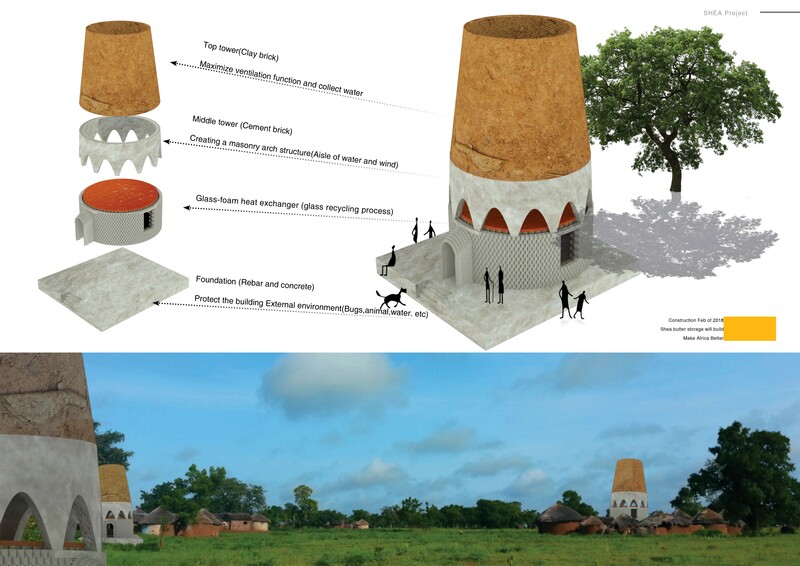 Optimization of waiting agricultural land: Interventions create a model for environmentally, economically and socially responsible cradle-to-cradle design. 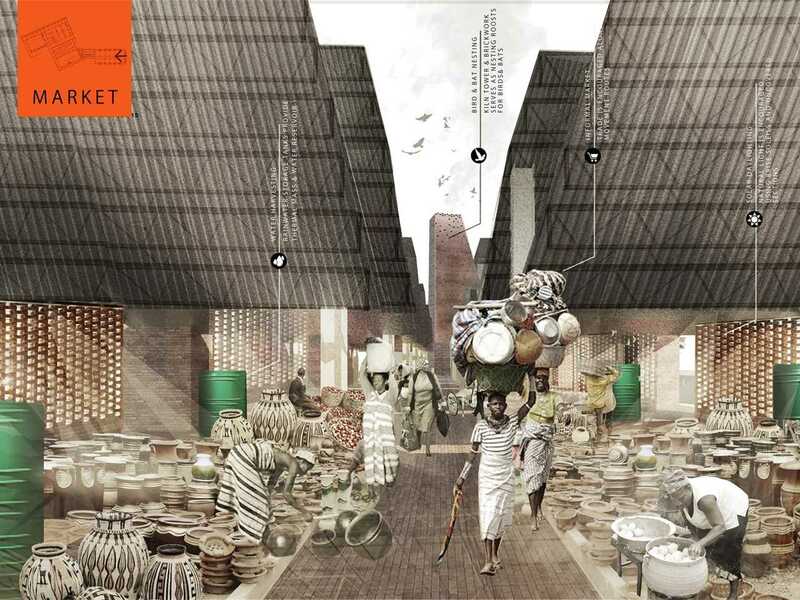 They propose urban farming, spaces for micro-economies, photovoltaic power generation, grey water usage, waste management and the integration of locally sourced and recycled construction materials. 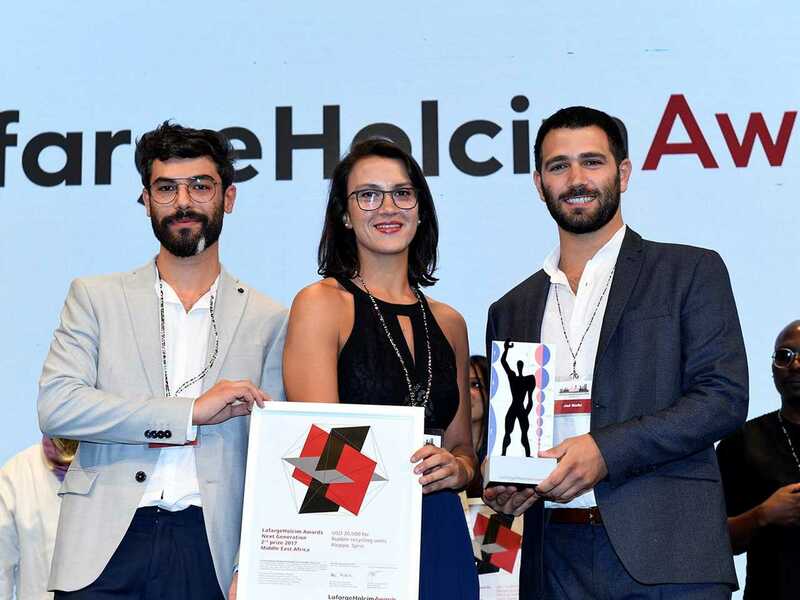 Winners of the LafargeHolcim Awards Next Generation 2nd prize 2017 Middle East Africa (l-r): Ghaith Abi Ghanem, Beirut, Lebanon and Nour Madi and Jad Melki of Ghaith&Jad, Beirut, Lebanon for Recovering Aleppo: Rubble recycling units, Aleppo, Syria. 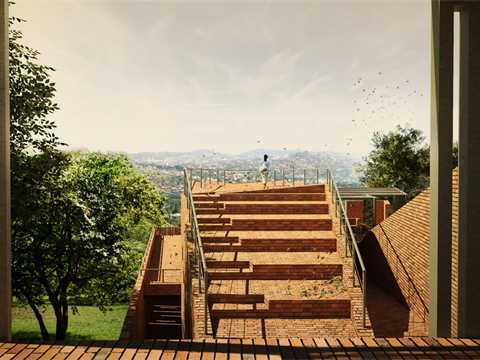 View of the project from the opposite mountain showing the surrounding urban context. 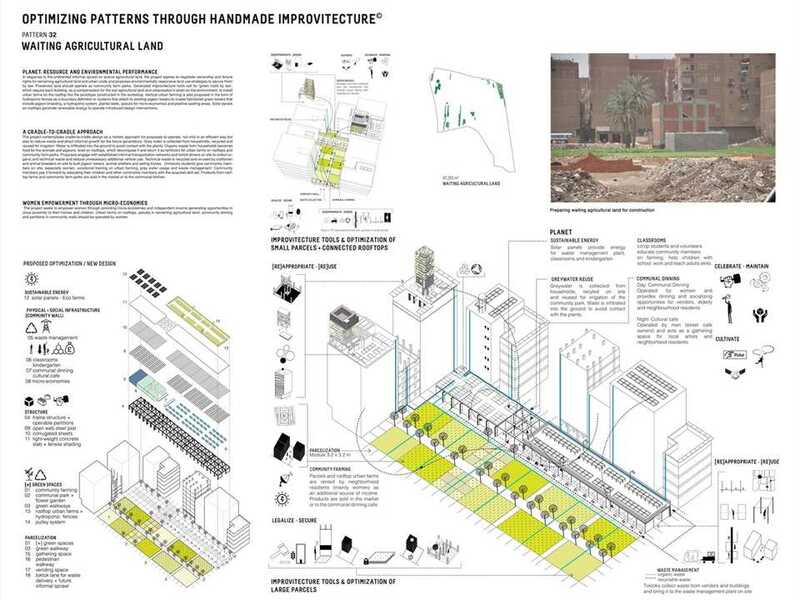 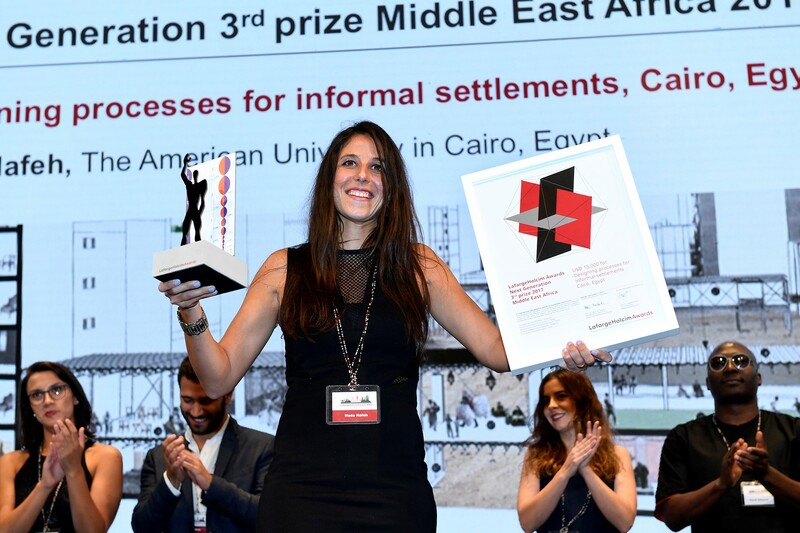 Winner of the LafargeHolcim Awards Next Generation 3rd prize 2017 Middle East Africa Nada Nafeh, The American University in Cairo, Egypt for (In)formal Pattern Language: Designing processes for informal settlements, Cairo, Egypt. 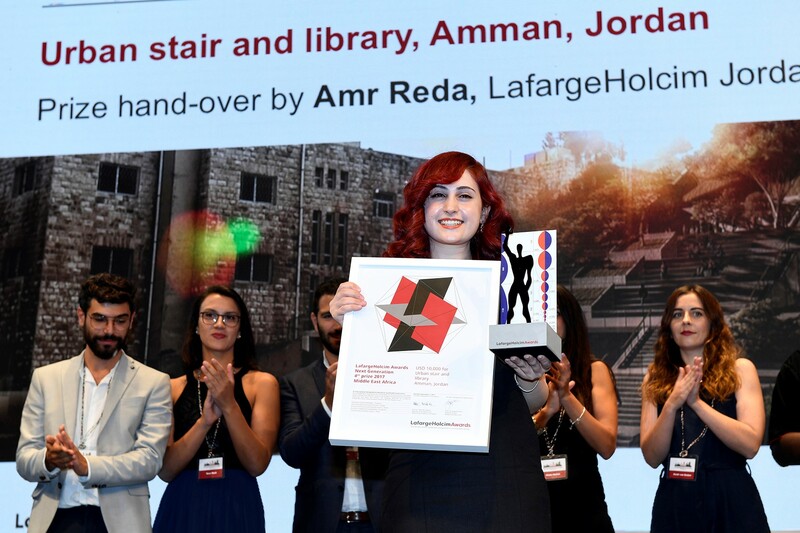 Winner of the LafargeHolcim Awards Next Generation 4th prize 2017 Middle East Africa Noor Marji, German Jordanian University, Amman, Jordan for Steps of Amman: Urban stair and library, Amman, Jordan. 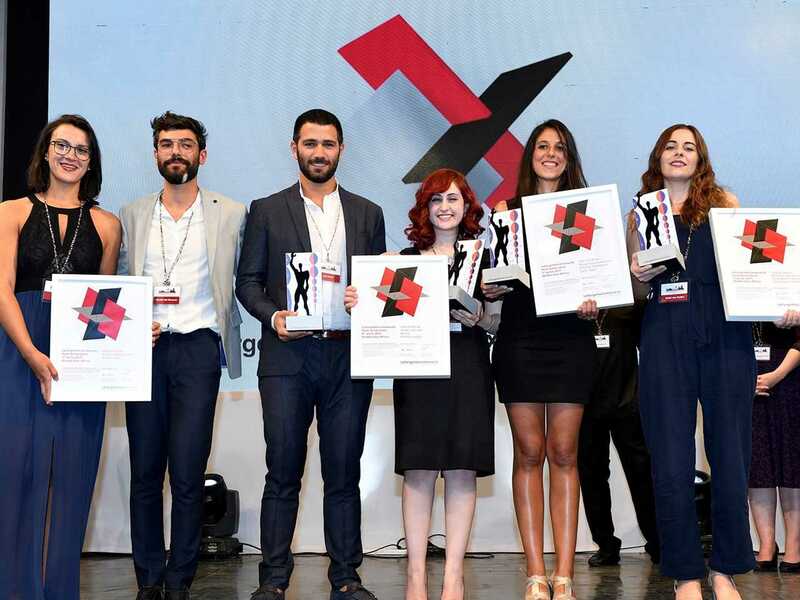 Winners of the Next Generation prizes for young professionals and students (l-r): Nour Madi, Ghaith Abi Ghanem and Jad Melki (Lebanon, 2nd prize); Noor Marji (Jordan, 4th prize); Nada Nafeh (Egypt, 3rd prize); and Heidi van Eeden (South Africa, 1st prize). 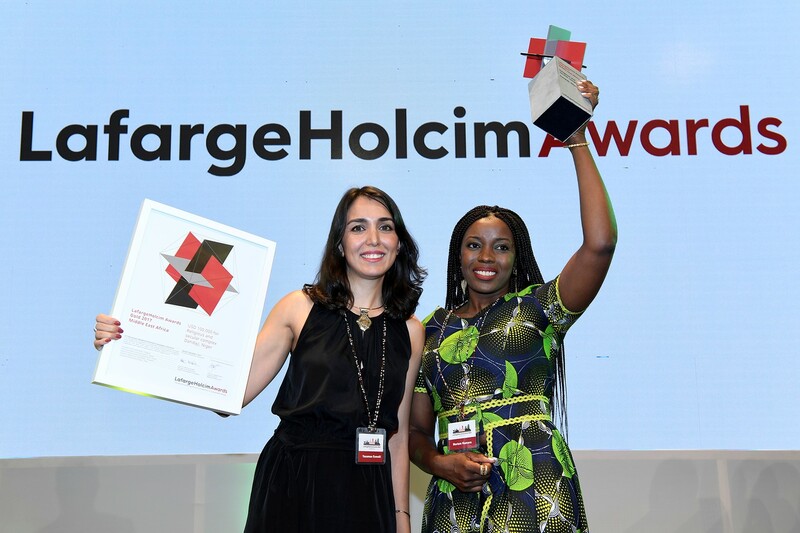 LafargeHolcim Awards Gold 2017 Middle East Africa – Legacy Restored. 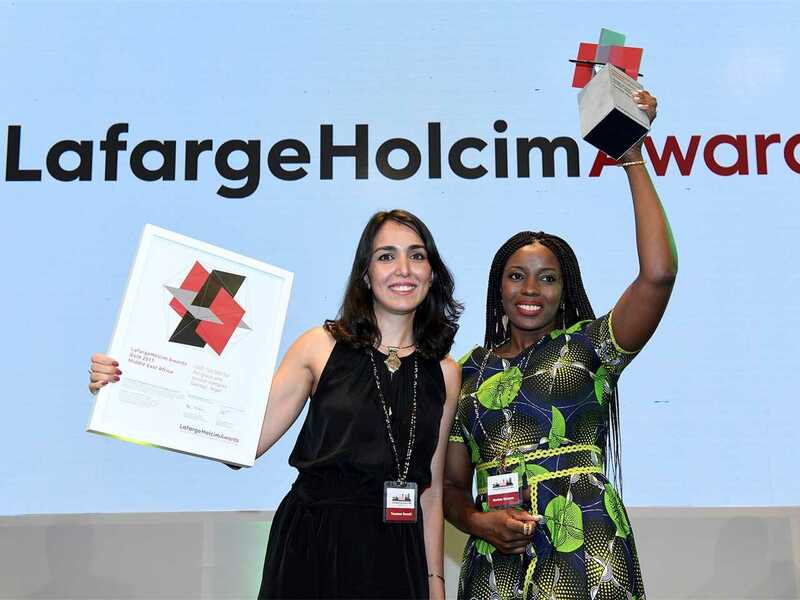 LafargeHolcim Awards Silver 2017 Middle East Africa – Weaving and Stamping. 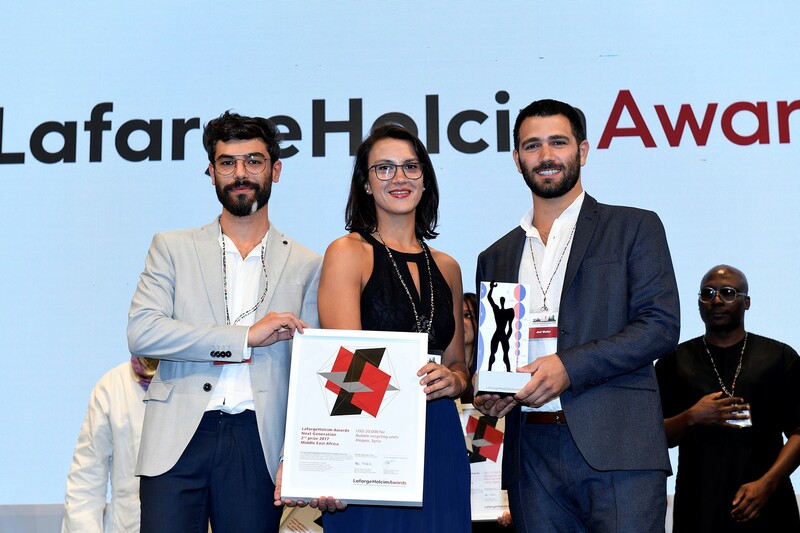 LafargeHolcim Awards Bronze 2017 Middle East Africa – Pavilion Re-claimed. 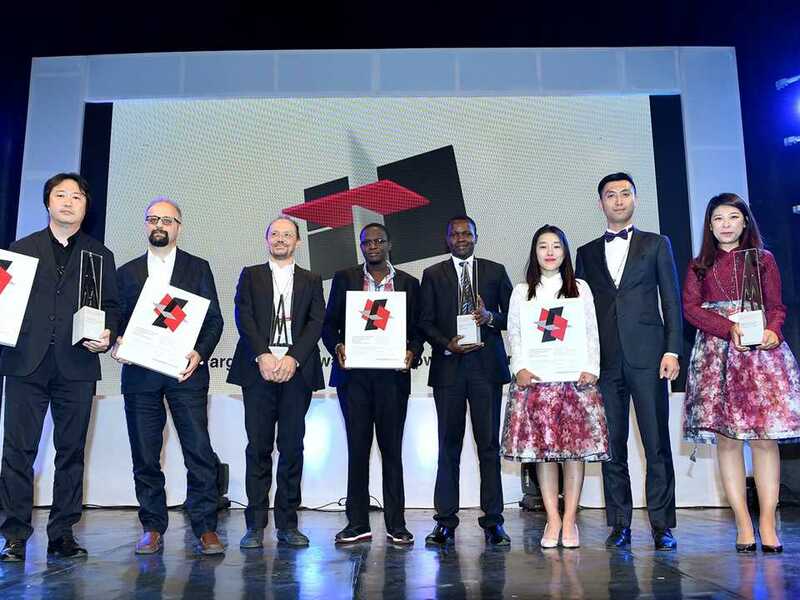 LafargeHolcim Awards Acknowledgement prize 2017 Middle East Africa – Ascending Array. 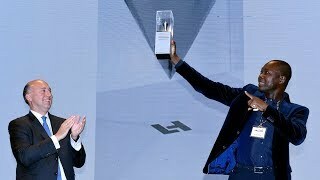 LafargeHolcim Awards Acknowledgement prize 2017 Middle East Africa – Reel to Real. 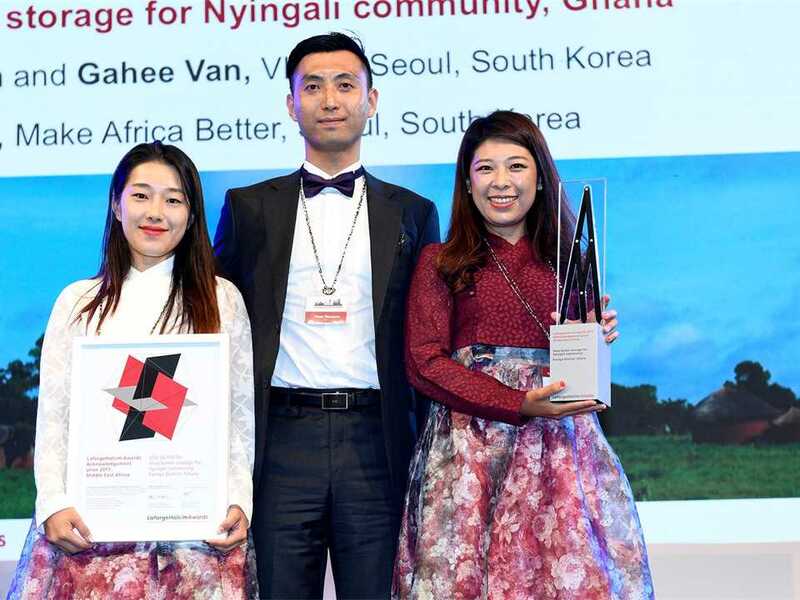 LafargeHolcim Awards Acknowledgement prize 2017 Middle East Africa – Refrigerating Jar. 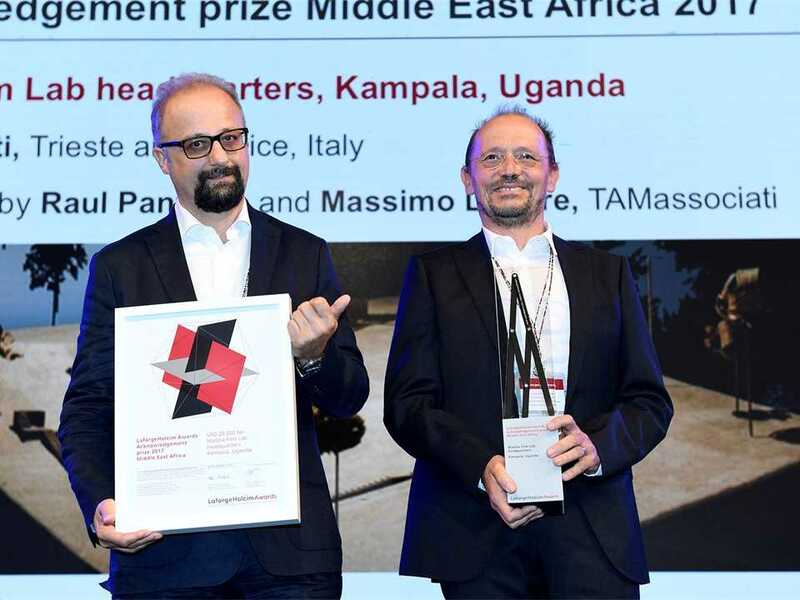 LafargeHolcim Awards Acknowledgement prize 2017 Middle East Africa – Through the Looking-Glass. LafargeHolcim Awards Next Generation 1st prize 2017 Middle East Africa – Brick-Works. 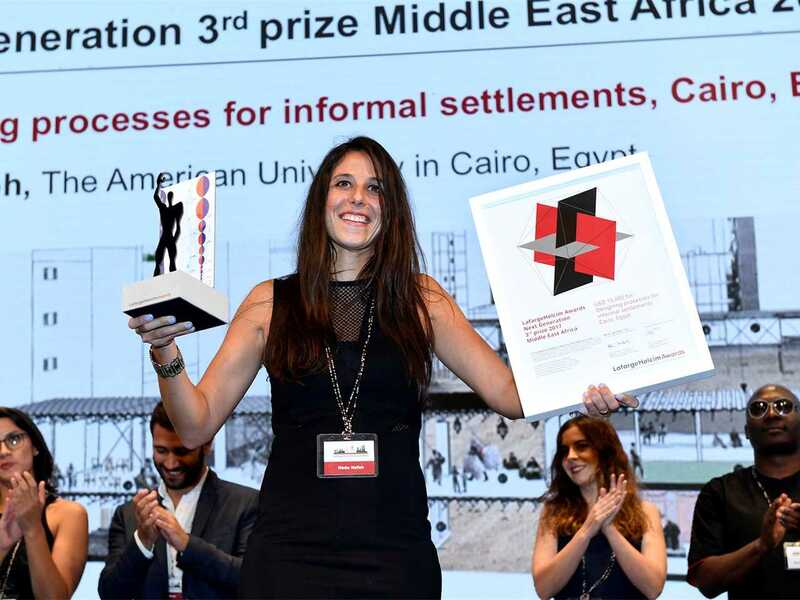 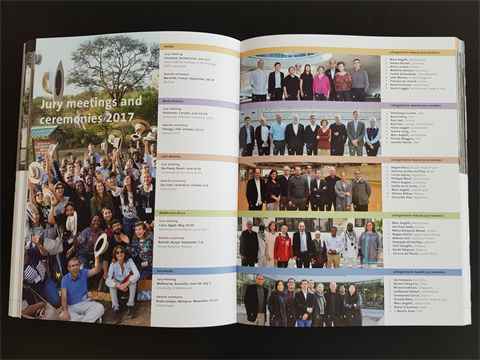 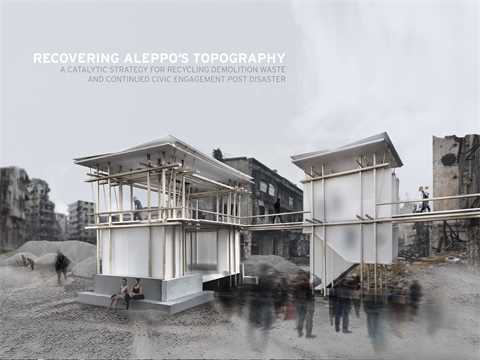 LafargeHolcim Awards Next Generation 2nd prize 2017 Middle East Africa – Recovering Aleppo. 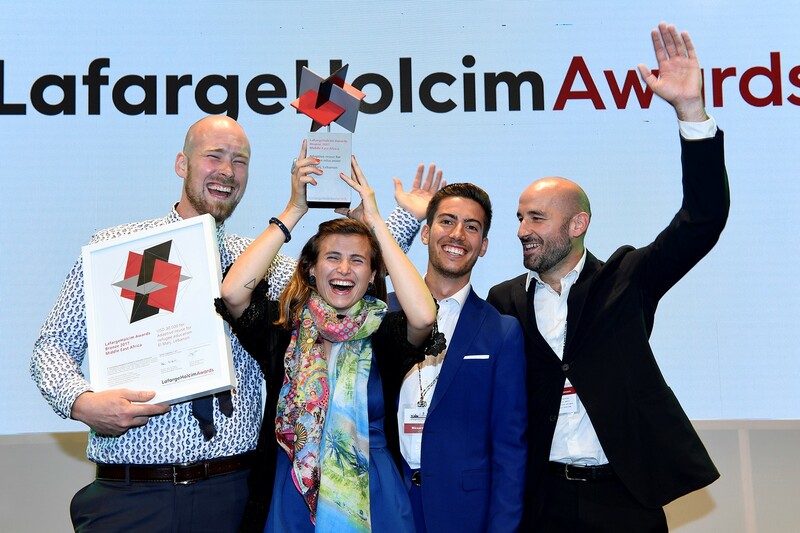 LafargeHolcim Awards Next Generation 3rd prize 2017 Middle East Africa – (In)formal Pattern Language. 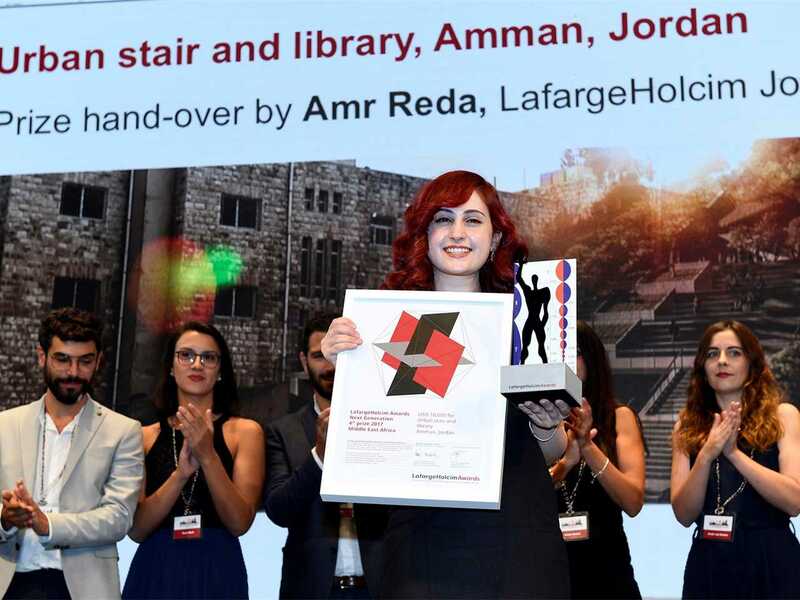 LafargeHolcim Awards Next Generation 4th prize 2017 Middle East Africa – Steps of Amman. 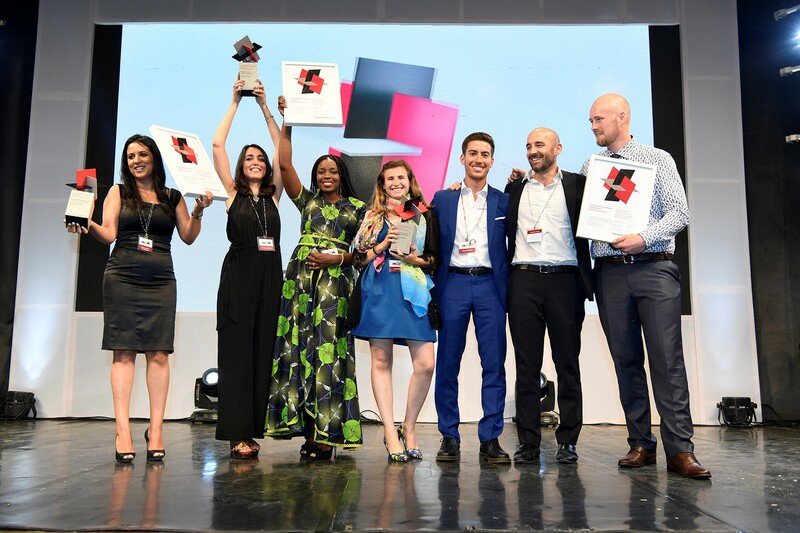 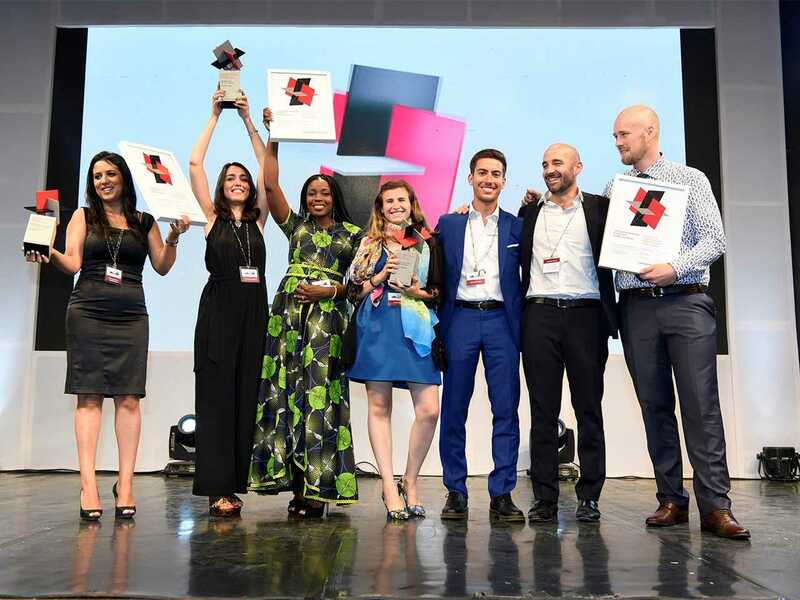 The winners of the LafargeHolcim Awards 2017 winners for Middle East Africa have been announced in Nairobi. 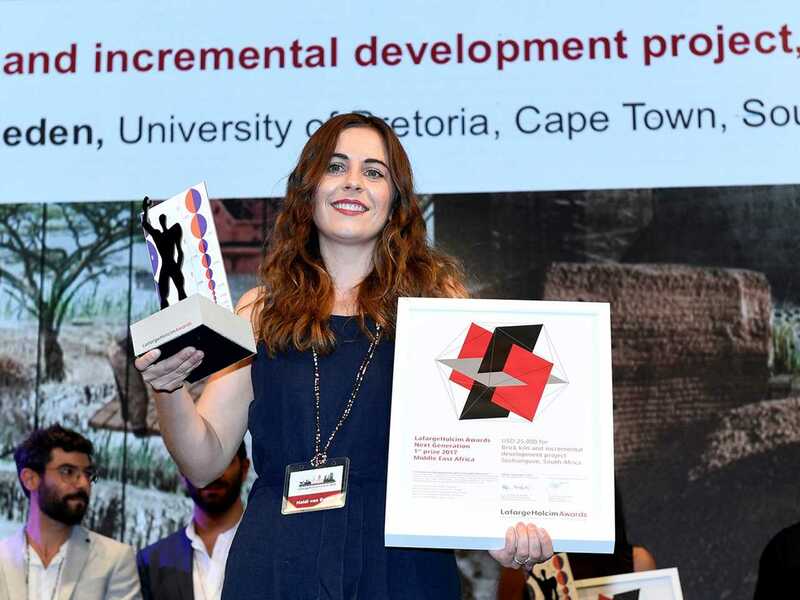 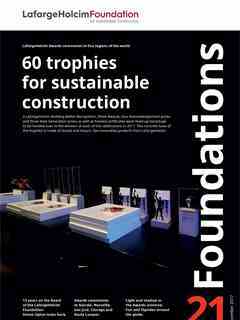 The eleven winning projects share in more than USD 330,000 prize money, and illustrate how sustainable construction continues to evolve – developing more sophisticated and multi-disciplinary responses to the challenges facing the building and construction industry.